Hey all and happy Tuesday! Finally feeling like spring here and sticking! I am so excited to not have to wear one hundred layers when going out. I am also excited to not have to wear snow boots with everything! I have been loving the new collection at Target, especially their new spring line! They are really stepping it up with prints and colors… plus they offer a wider range of sizes in all their pieces as well. 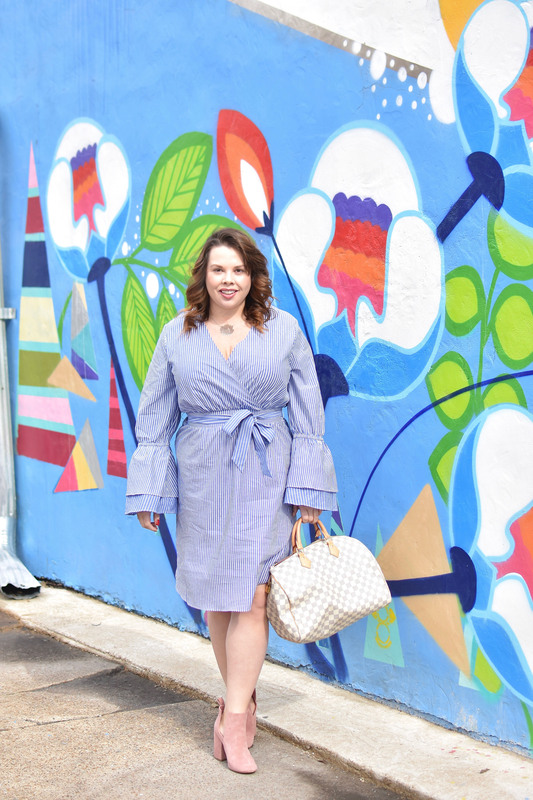 I love that most things that I wear are now available in straight and curvy sizes! I loved this dress when I saw it, especially because of the subtle stripes and sleeves. I wanted the whole look to feel a bit more spring, so I added these pink booties, that I am so excited to be wearing again! 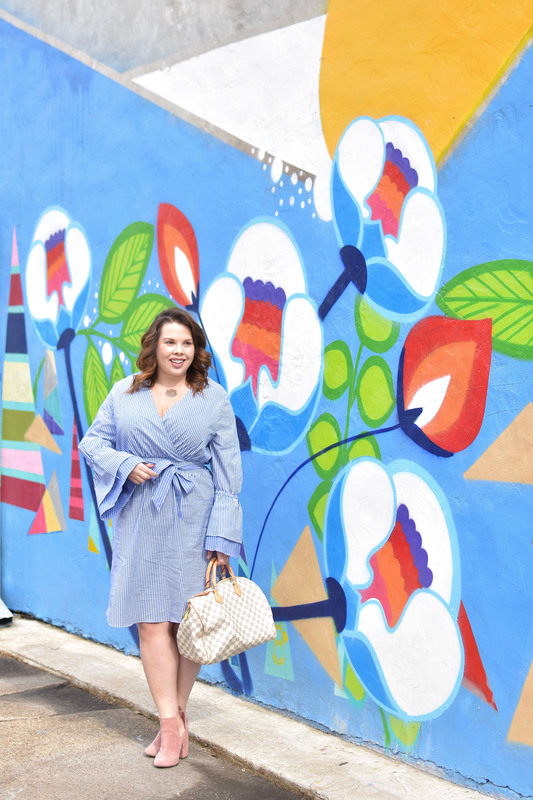 I love the combo of light colors together in this stripe… so the light blue from the dress and the light pink booties were the perfect combo for me. Hope you all have such a fabulous Tuesday! Target is just the best, and this striped dress is beautiful on you!! There is a striped jumpsuit I have been eying but it sold out in my size ?? That dress really looks good on you. I love that you partnered it with a brown boots. Great job in putting this all together! This is such a cute dress! I might need to grab it for Spring and Summer! 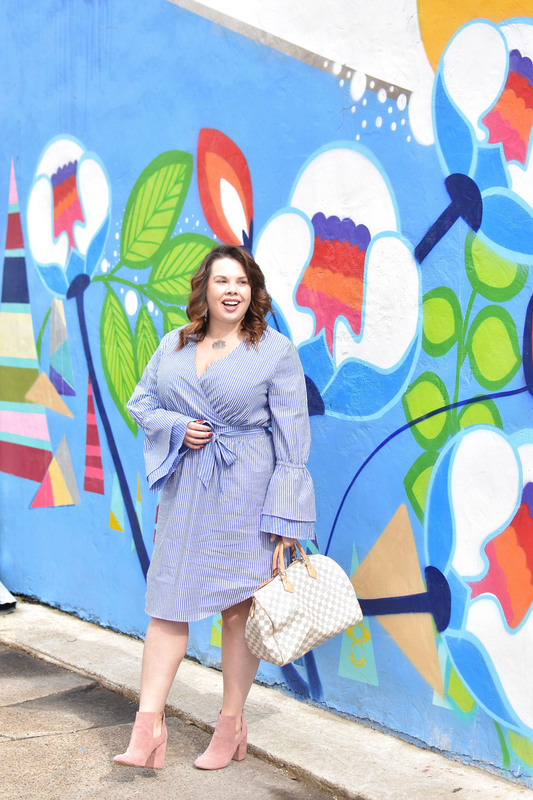 This dress is super cute on you! And I love how you paired it with the pink booties! 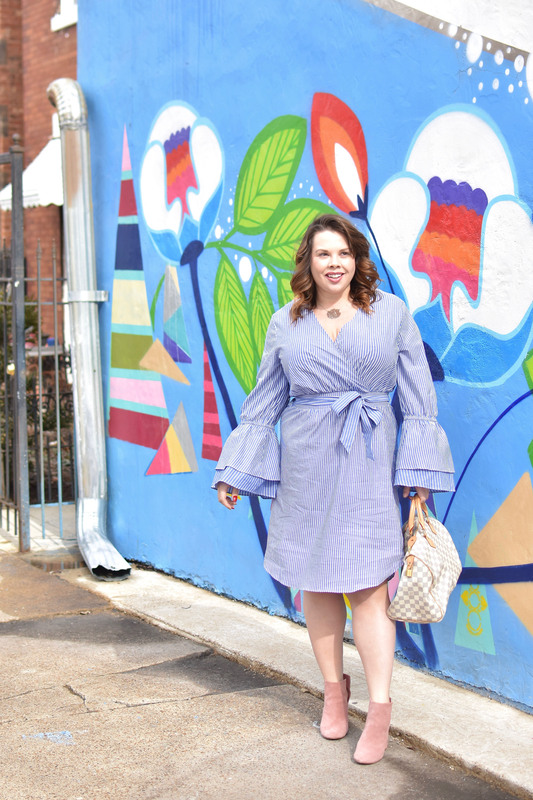 That dress is so pretty and perfect for Spring – I can’t believe it’s from Target! You’re right that they’re really stepping up their fashion game! Amen for warmer weather coming — I can’t wait! Bring it on. I’m so excited to start dress shopping and this is one I need to add to my collection. YOU LOOK SO GORG. This dress was MADE for you. those boots are stunning and you are SO ready for spring with that dress! That dress looks so pretty on you! I love those pink booties too! Love this whole look girl! You pull off that dress so well. So excited that it’s finally kind of feeling like spring, haha! LOVING those blush booties– cute! It looks amazing on you! I knew I had seen this number at Target. I tried getting it but they didn’t have my size. I own so many blue and white stripped dresses. It’s pretty much what my Spring and Summer wardrobe is made up of! this look is so perfect for Spring! That dress is too cute on you! You can never go wrong with simple stripes! I’m loving this dress on you, it’s the prefect dress for this season too and you look beautiful.